Event reporting is available for Producer+ and Enterprise licences and allows you to view reporting for events via an online dashboard or extended reporting via file download. You are able to view statistics for both live and On Demand events. From the Events tab, click on the event you wish to view a report for. Clicking on Report Setup will take you directly to the event reporting page where certain default report items are selected for you. To customise a report click Show all options. 1. Firstly, select the data range of the report. This can either be all data for that event or a custom data range using the calendar/date selectors. 2. Select the event session that requires a report to be generated. This can either be the Live Event, the On Demand event or both. 3. Once events have been selected, click Save New. Give the report a unique name for search purposes. You will then be able to view your report and a create a shareable URL will be created. Once a report has been generated, all report types selected in the dashboard will appear for you to view. The reports can be displayed in a number of formats depending on the report type. 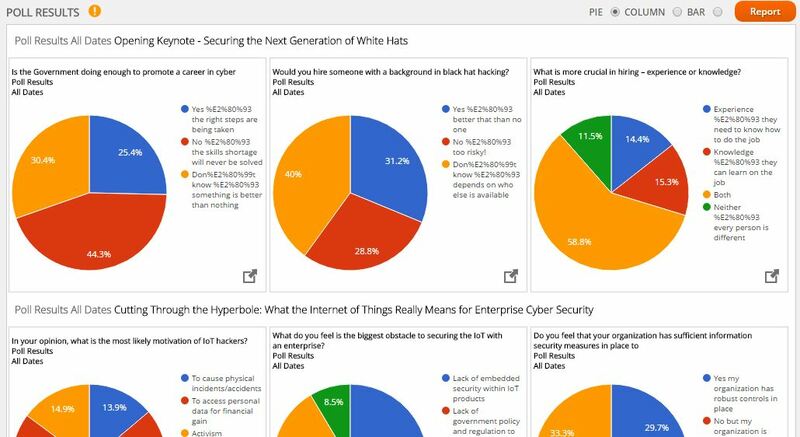 These can be selected via the appropriate button (column, bar, pie chart, etc). To generate a spreadsheet for any of the reports generated click on the 'Report' button to the side of any individual section. This will generate a view-only spreadsheet along with a downloadable Microsoft Excel version which can be edited once downloaded. Larger versions of each report section can be viewed by clicking the icon at the bottom right of each section. Displays the number of registered users compared to number attended users. 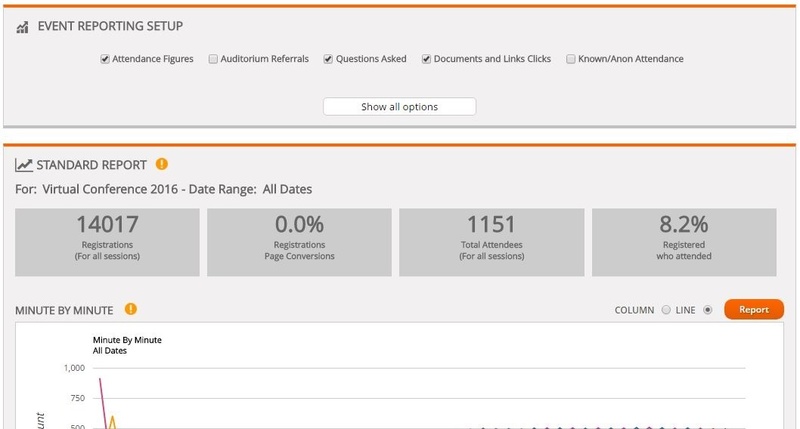 Displays a breakdown of referrers for the Auditorium page. Displays the average attendee viewing duration. Displays the number of Registration page hits. Displays a breakdown of referrers for the data capture form. Displays the number of times each Document and Link listed on the Auditorium have been clicked (Extras > Documents & Links section). If Graded Polls have been included, the pass/fail results of these will be displayed. Shows the known compared to anonymous attendances and sessions. Shows the duration each presenter of live event presented for. Note: the 'Presenter Switching' functionality within the presenter console would need to have been used to populate these figures. Shows the number of questions asked and how many of those questions have been answered. A User Journey Report can be generated to include all reporting information within one spreadsheet document. 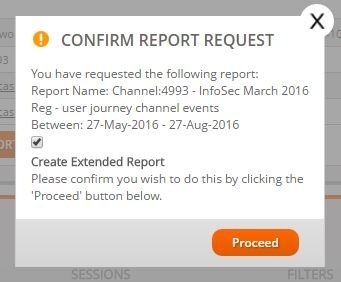 Select the Event you wish to generate a User Journey Report for and click the User Journey Report button. On the popup, check box that states Create Extended Report and click 'Proceed'. You will be taken to the Reports Tab. 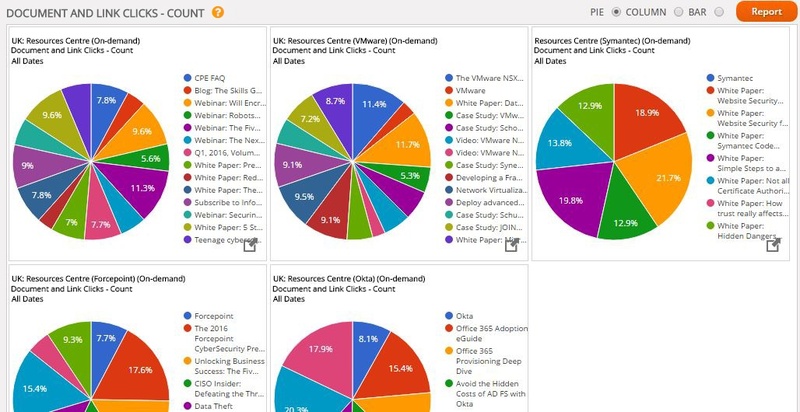 The User Journey Report typically takes 24 hours to generate. Once generated, a green tick and a download button will appear and you will be able to download the Excel document. Note: Two excel documents will be available. The first will be the Channel Event Activity Report and the second will be the Channel Events Report. Users are able to share a direct reporting URL allowing viewing of a specific reporting page without requiring a platform login. The report can be tailored to include specific reporting filters as demonstrated above. These links will allow access to the specific event report page without the ability to navigate to any other areas within the WorkCast Platform.